Adams Slide Trail. It's overgrown but can be followed with care. Adams Slide Trail, heads over boulders in the woods. Adams Slide Trail, It's very steep but all enclosed so it's not intimidating. Adams Slide Trail. It's pretty gnarly going up through here, protect your eyes from rouge branches! Adams Slide Trail. Gets a little "scratchy" notice the top of the rocks that is the old slide. Must have been quite the site fifty years ago when these rocks were not buried or the trail was not so enclosed. Blaze to the right. 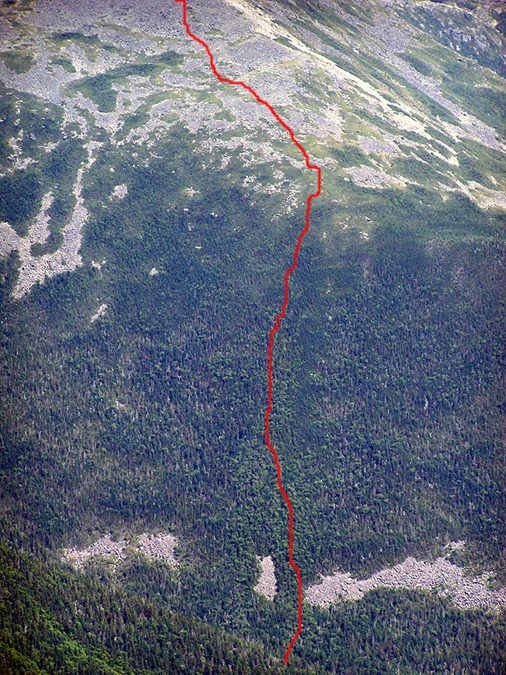 There are more blazes found here than any other trail in the wilderness area! Adams Slide Trail. Track is visible in this pic. Adams Slide Trail, if you head up it you'll know when you're on it and when you are not. When you're not on track, it's a really rough whack! Adams Slide Trail, looking down it. I've been up it twice but never down it, I don't think I'd want to descend it, not because it's difficult but because I think there are higher odds of poking my eye out. Adams Slide Trail. This section of fifty feet or so had some trickling water on it. I stayed to the right into the thick woods to not damage it. Adams Slide Trail. Notice the faint paint on the rock. Adams Slide Trail, I see the light, getting there! Last section before you pop up in the middle of nowhere. the following! Notice the faint gaps between the branches, that's the trail. If you push the branches back when heading through the scrub tunnel you can spot a blaze or two on the boulders that try and trip you up! Great Gulf. This was a decent sized cairn three years ago, topped with white quartz. now it's been whipped out by weather. Adams Slide Trail, one of the few white quartz cairns left. Adams Slide Trail, notice the small white quartz rock. Once again the cairns are smaller than before. Heading up the boulder field. Lots of loose rocks, foot placement is key! Kept seeing cairns, so I kept following them! Adams Slide Trail, last blaze I saw, notice the red paint on the rock. Pretty cool stuff! Well above 5,000 feet at this point! One final scrub area to rock hop around before reaching the Star Lake Trail just below the summit. Where the Adams Slide Trail goes, there is a small cairn in the pic which is was taken from the Star Lake Trail. This is the first cairn for the Adams Slide Trail. It usually is not there for obvious reasons. To keep people from exploring. Probably will be taken down by a ranger soon, so don't count on this to be there. Thanks Chris for posting this. What a super-terrific job of chronicling the trek up the abandoned Adams Slide Trail. I truly admire the types of hikes you do, and the way you report them.